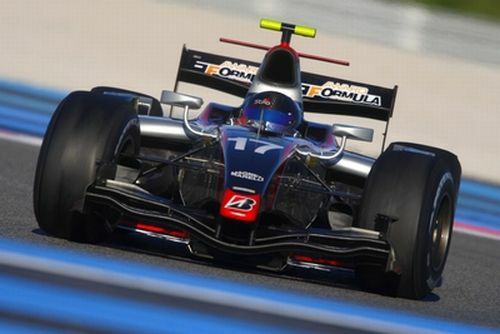 11.11.2009: International Formula Master (IFM) winner Fabio Leimer claimed his championship prize today, a day testing with GP2 Series team Dams at the Paul Ricard circuit in France. International Formula Master (IFM) winner Fabio Leimer claimed his championship prize today, a day testing with GP2 Series team Dams at the Paul Ricard circuit in France. The young Swiss driver was rewarded with the test for his dominant championship campaign, which saw him win seven races and secure six pole positions throughout the 2009 Formula Master season. "Today's results didn't show Fabio's real talent. We had a technical problem on the car, which didn't help him get to the top of the timesheet. The whole team really appreciated working with Fabio though and the results he has produced in Jerez and the GP2 Asia Series show how competitive Formula Master drivers are and how ready they are to fight at the top of the GP2 category." Jenzer Motorsport graduate Leimer added: "Working with the team today was very good; we had some issues with finding the right set-up, which unfortunately showed in the lap times but they never gave up. We kept trying all day and from an engineering point of view it was absolutely great to work with them." IFM drivers Josef Kral, Alexander Rossi and Vladimir Arabadzhiev were also present, as well as 2007 Champion Jérôme D'Ambrosio, with the GP2 Series' winter testing concluding tomorrow.